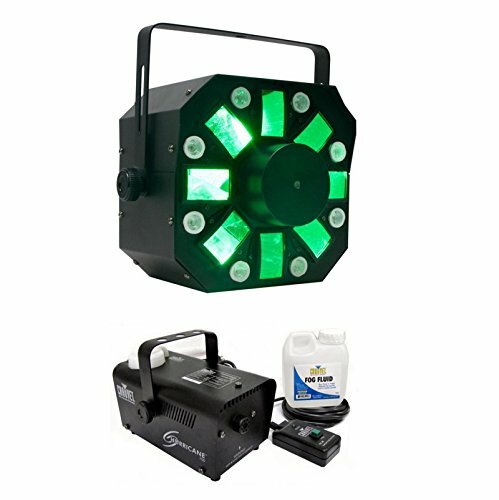 The American DJ Stinger offers 3-FX-IN-1 utilizes three light sources - six 5 watt hex-LEDs, eight 3 watt white LEDs and a red and green laser - to give users a moonflower/strobe/laser combo effect that creates new levels of pure lighting excitement for audiences. The American DJ Stinger is lightweight so mobile DJs, DIY touring bands, and event organizers can take the highly-portable Stinger on the road as part of their mobile setup, giving them a compact but powerful effect at an affordable price. Small clubs, lounges and bars bound by a strict budget can also utilize the varied effects of the Stinger without breaking the bank. Also included is the Chauvet fog machine, which is perfect for any party or event. It provides the quality, performance and innovation that Chauvet is known for. This Chauvet fog machine's generous-capacity tank and quick heat-up of water-based fog can fill most small venues within minutes. It features a 0.6 liter capacity, a 2.5-minute heat up time. Trigger the Chauvet fog machine using the included wired remote. The LED indicator on the remote indicates when the fogger has reached the required operating temperature. Press the button on the remote to momentarily output fog. The length of the permanently wired remote is 13 ft (4m). Please note that because the remote is permanently wired it does not have the option to be activated by a wireless remote.